“R. Wittingham N. York” is a misspelled mark used by the brass founders Richard Whittingham, Sr. (1747 to 1821) and his son Richard Whittingham, Jr. (born 1776). 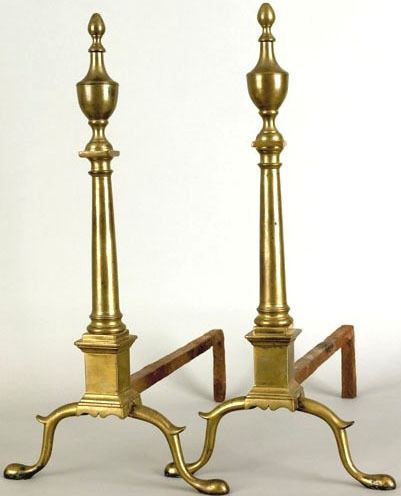 It is found impressed on high-quality brass andirons of the period 1800 to 1821. Richard Sr. was active as an American brass founder from 1795 to 1818; his son Richard Jr. is thought to have been active in the business circa 1810. Richard Whittingham, Sr. was born on February 5, 1747 at Newport in Shropshire, England, and was trained as a brass founder in Birmingham. In the 1787 edition of Charles Pye’s Birmingham Directory he is as listed as “Caster for Hire”; in the 1791 edition he is listed as a “Solder-maker”. In 1792 he is listed in the Universal British Directory of Trade, Commerce & Manufacture (Vol. II) as “Solder Maker, Metal Worker” of Upper Priory. However, the Whittingham family sailed to America in 1791. In 1847 Richard Jr. wrote that in 1791, at the age of 14, he was the family’s oldest living child (the first two having died) on the voyage to the New World. He reported that the family stayed in Wolverhampton with his uncle Charles Whittingham for a few days in June of that year before heading to Liverpool to set sail. They left Liverpool on July 14, 1791 on the ship Baltimore Union bound for Philadelphia under the command of a Captain Blythe. Richard Jr. also recorded that a certain number of American sailors were up to no good in Liverpool on the Fourth of July. Local carpenters retaliated by cutting the rigging “to pieces” on several American ships, including the Baltimore Union, which had to delay its sailing until the 14th in order to make repairs. The Whittinghams’ ship landed in Philadelphia (then the U.S. Capital) on September 22, 1791, young Richard’s 15th birthday. In 1847 he wrote that his father was “soon called upon by some gentlemen” to move to Patterson, New Jersey to establish a “Society for the Encouragement of Useful Manufacturers.” The Whittinghams remained in New Jersey for four years until they removed to New York City in 1795. Father and son worked as brass founders in New York from 1795 until 1818. Richard Sr., fiercely proud of his English heritage – he remained a British citizen throughout his life until his death on September 13, 1821. Richard Jr. carried on his father’s allegiance until 1844 when he became a U.S. citizen late in life. However, as British citizens during the War of 1812, the Whittinghams had to report to American authorities. These records show that both Richard Sr. and Richard Jr. were British aliens living in New York, along with the younger brothers Joseph and Charles. The 1812 record lists Richard Jr. as being of 36 years of age and having resided in the U.S. for 21 years. Furthermore, he is described as being 5 ft. 6.5 inches tall, of fair complexion with dark hair and eyes. The alien registration lists Richard Jr. as living at 124 Harman Street (now called East Broadway), where he was a brass founder for the Navy. It lists a wife and three children at that time. The subsequent career of Richard Jr. is well documented in New York records. In the 1816 New York City Directory he is listed as a brass founder working at 95 Henry Street, but still living at 124 Harman Street. A drawing survives showing the Whittingham house as a tiny cottage where the family remained until at least 1828. The 1836 New York directory has Richard still working as a brass founder in Henry Street. His brothers Charles and Joseph are also listed as brass founders in this directory. In 1837 Richard and his wife Mary Anne became communicants at All Saints’ Episcopal Church and still living at 143 East Broadway (formerly Harman Street). Mary Anne died in 1849. This same craft and residential information is repeated in the 1839/40 Directory and Doggett’s 1850-1851 directory has Richard listed as a founder working at 98 Henry Street and living at 147 East Broadway. He would have been 74 years old at that time. Based on this record it is unlikely that Richard Jr. worked very long for his father’s foundry, or continued that business after 1818 as he appears to have worked mostly for the navy. Thus the beautiful and well-crafted brassware, known to antiques collectors by its misspelled “R. 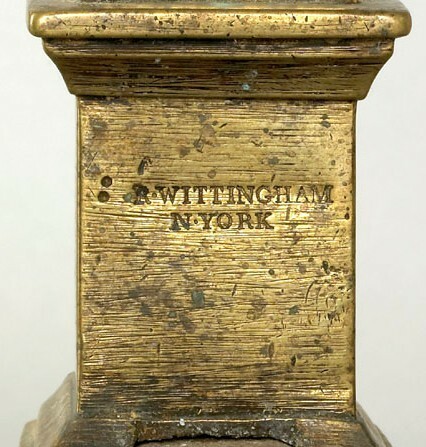 Wittingham” stamp, can be reliably dated from 1795 to 1818 in New York City. Reference note by p4A editorial staff, October 2011. Genalogical details in part from genalogy.com.